Unique handcrafted custom jewelry designs! Choose a cabochon and we will design and create a one of a kind piece of contemporary handmade jewelry for you. Artist designed, original handcrafted contemporary art jewelry. for those who desire unique wearable art or for those who want a custom created design. 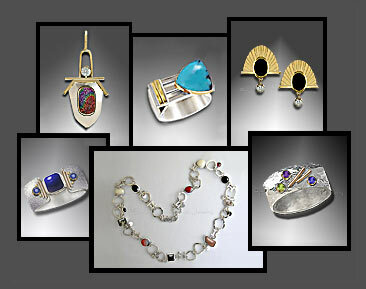 Nancy's handcrafted jewelry is inspired by Asian and African art, geometric shapes, bright colors and natural gemstones. Her use of color, textures and stones is bold and dramatic. Incorporating the lapidary arts in her designer jewelry allows a great deal of flexibility in her designs which feature unique free form cabochons. Take a tour of her studio and meet her special "security team". in handcrafted, one of a kind, gold and sterling silver designs. ~ Cabochons ~ Agate, amber, ammolite, ammonite, boulder opals, charoite, chrysocolla, chrysoprase, dinosaur bone, drusy, fossil, jasper, lapis, larimar, malachite, Peruvian opal, palm wood, rutilated quartz, spectrolite, tiger's eye, and turquoise cabochons available for my custom jewelry designs. See the index of fine jewelry from this artist listed by type and major gemstone. A second list sorted by type includes major, minor and accent gemstones. Ethnic Beaded Necklaces and Detachable Pendants! As a fine jewelry designer, Nancy will work with clients to create an individualized design in her signature style. Visit one of a kind jewelry art gallery for a preview of her handmade designs or the custom jewelry order page for information about commisioning a piece.